Machine monitoring is an interesting and (for most providers) a unique application of video surveillance. Q: Why is Machine Monitoring a Unique Application? GuardDog's hardware communicates and we have the technical capabilities and experience to bring to reality virtually any machine to video system integration you might have in mind. Another client came to GuardDog with a relatively simple video only application. They had a critical machine (a large industrial shear) that was a safety hazard to the operator, a number of people sorting the machine’s output and virtually anyone within a 30 or so yard radius of the machine. "The Shear" (pictured left) is ~35' tall (surrounded by the yellow cat-walk) and is used to reduce large recyclable metal into more managable pieces. GuardDog's PC-DVR is located in an operator house to the right of the picture (behind the "mountain" of metal) and is exposed to wide temperature swings and a lot of dust and debis. Incidentally, the track loader (left of the shear) is used to "feed the beast." Since 9/2007, our equipment has been running 24/7 - 365 without a single minute of downtime! Phase II of our design was to duplicate the video images as well as all the machine control functions from the control room and wirelessly migrate them (in real time) to a monitor and control console in the track-loader. Our design concept eliminated an entire man-year of operations costs as all the machine controls would then be reduced from two men to a single employee. 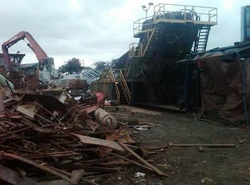 During our initial consultation with the owner of a significant recycling operation, we learned the firm had recently been exposed to a significant unemployment compensation claim and had paid the hospital expenses for an employee that was hurt on the job – even though the accident occurred as a direct result of the employee’s self-initiated mischief. Our customer was relived to learn that GuardDog could easily add a couple of cameras to his system and that he'd be able to monitor (and record) the employees actions at (and around) his sorting conveyor. Since installation, there have not been any additional work-related accidents and company management reports, "Since the employees know the cameras are capturing their every move, all their dangerous behavior has stopped." Sidebar: We did not further integrate this specific machine because this firm’s management tends to roam the floor and knows the shop’s operations at all times. Had management elected to, we could easily integrated a machine stop (PLC or relay output) as an input to our DVR. Whenever the conveyor was shut down our system would then sound an alarm, turn on a service light, etc., in the shop office. This would be an example of hard-wired machine I/O integration.